Memphis Depay must show strength to cope with his "difficult situation" at Manchester United, according to Holland captain Arjen Robben. The £25million summer signing has failed to start a Barclays Premier League game since United's 3-0 defeat at Arsenal on October 4 and this week hit back at questions over his attitude. Depay said he is "working hard" to win back the first-team place he has lost to youth-team product Jesse Lingard at Old Trafford. Holland head coach Danny Blind was quoted as saying that Depay was not a team player when he was originally left out of Friday's friendly against Wales, but the 21-year-old winger was later reinstated to the Dutch squad for the Cardiff game. 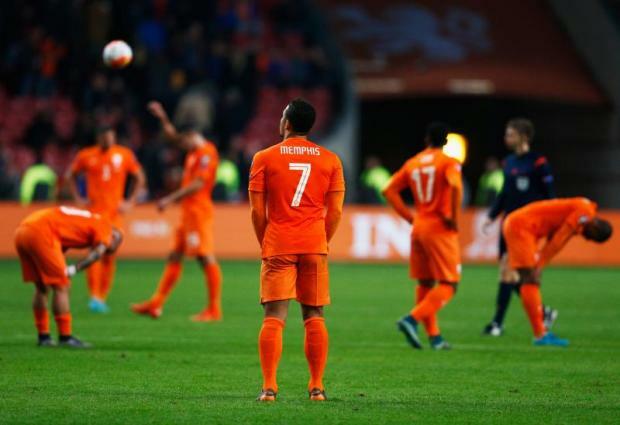 "Of course I will give him advice," Bayern Munich star Robben said about Depay at the pre-match press conference. "We try to help each other as players and the team to make steps. "He is a talented player in a difficult situation. "I can give him advice but the player has to cope with it, show strength and the right mentality. "It is important in your development as a player. It is not always sunshine and you have difficult periods, especially when you are young. "He has a long way ahead and if he shows the right mentality, the talent is there. "If he keeps working hard I am sure he can succeed." Holland failed to qualify for the European Championship for the first time in three decades when they finished fourth in their Euro 2016 group. They are providing Wales with their first test since Chris Coleman's side qualified for the finals in France next summer. The two countries last met in Holland's final fixture before the 2014 World Cup in Brazil, Louis van Gaal's side winning 2-0 in Amsterdam. "It is funny how things work sometimes," Robben said. "The situation is different, they are going to the Euros and we are not. "It is painful, but it is down to us. The only thing we can do is try and restart and rebuild. "It is not nice to say, but we have to start again and prepare for September 2016 and the World Cup qualifiers. "It is a long way off but we have to cope with that reality, get some good results out of the upcoming games. "These are the games we have to try and use to turn it around." Robben revealed that he had defied Bayern to join up with the Holland squad in Cardiff. "Bayern would prefer me to stay at the club and stabilise my physical condition but I wanted to be here," said the 31-year-old forward who missed two months of his club's season with a thigh problem. "But this game matters to me and that's why I am here. "We had a good conversation about it with the coach. "We are building something new, this is a new project. "It matters or I would not be here."